The history of this weapon is the same as noted when the first 105mm kit came out in May 2009. After WWI the US Army formed the Westerveldt Board to develop American weapons systems for the US Army, as since it had not developed sufficient weapons on its own it had to borrow or buy foreign systems for use in WW I. One of the first designs which was proposed was what was then a medium field howitzer in 105mm caliber. But due to a lack of money and other factors the weapon was not placed into production until 1940; the good news was that in the interim it had been developed and received several useful changes, such as the ability to handle unitary ammunition and employ a split-trail pneumatic tire carriage for high-speed movement and high angle fire. 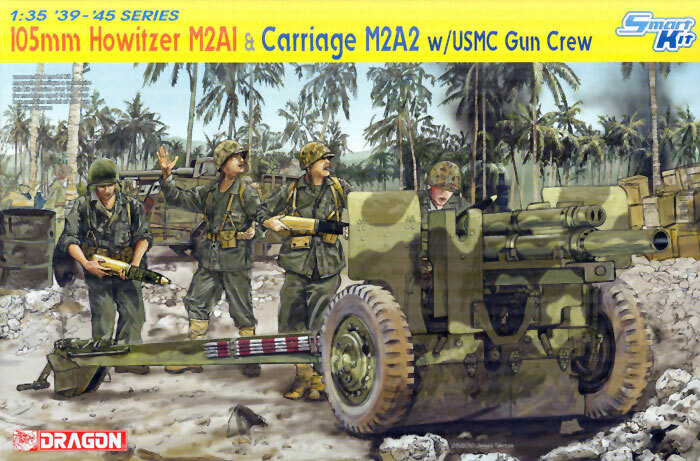 The new weapon came into service as the M2A1 howitzer on the M2A2 carriage. Able to throw a 33 pound projectile up to 12,500 yards, more than 8500 were built during WWII and production continued on into the 1950s. More than 10,200 were then completed, and many were upgraded to the postwar M101A1 standard and served through Vietnam, finally being retired by the Reserves in 1980 when – oddly enough – the Army bought the British L119 lightweight 105mm howitzer to replace it as the M119. The “105" still serves with several foreign armies and has received new barrels and other modifications in their service, so it is one of the longest serving weapons in modern history. 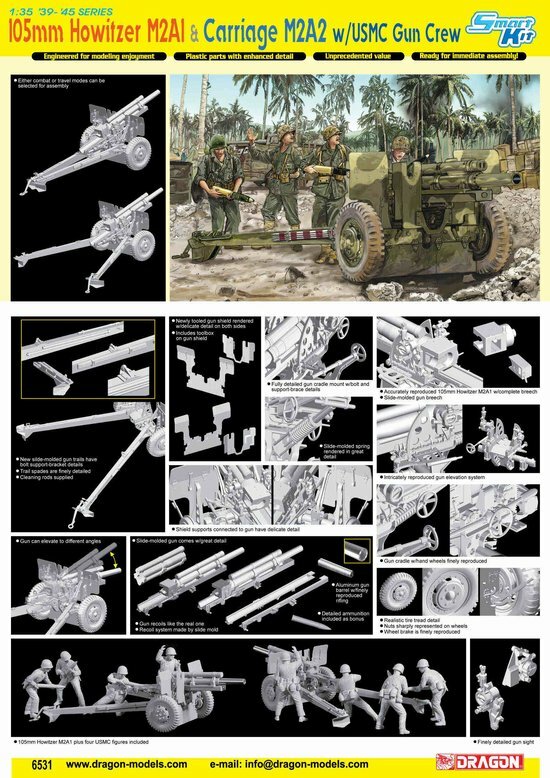 This is the second release of this kit as a separate towed howitzer but this time adds a Marine Corps crew of four – actually it is set No. 6038, USMC - Iwo Jima 1945 with a new dedicated sprue bearing four arms and three 105mm rounds. The 105 itself is a “Smart Kit” and has features such as the entire center section of the howitzer molded in one piece (recoil and recuperator sections and barrel tube) by the use of slide molding. The gun is completed with a turned aluminum muzzle section with rifling and a four-piece breech block. The cradle comes in four main parts with the outside sections and slots for the howitzer to travel in as separate parts. A goodly amount of attention has been paid to the elevating and traversing section gears and also the sights. The gunshield is in styrene and has both of the supplemental flaps installed in the erect position; however, many WWII photos show the left section folded down. As this is the WWII version, the gun shield top is swept back and not vertical as with many of the M101A1 versions used postwar. The lower carriage includes a choice of brake drums (but no indications as to which ones or why other than there are two sets. Note that part C27 – the lunette – is shown in the combat or firing position, and if the gun is displayed in towed position it needs to be rotated 180 degrees to fit on the towing vehicle (such as a GMC CCKW 353 truck). The trails are NOT moveable as the kit comes and you are only given the option of towing (closed) or firing. “Boo birds” will be happy to know that after all of the snarls over their halftracks DML did not mold the tires with a bulge but perfectly round for this model. As noted the crew here is from a previous DML set and uses “Gen1" figures of six parts (head, torso, arms and legs) plus kit. They have the Marine Corps style helmets with camouflage covers and also three K-Bar knives are provided as part of the accessories. In this case it locks the gun into use only with Marine Corps units in the Pacific from about mid 1943 to 1945. While the box art oddly shows at least two of the crew fitted with some sort of boots or leggings, the fact is that all four figures have unbloused utility trousers with shoes. The four new arms now provide for serving the gun with more realistic poses than the original combat ones. No weapons are provided, which for Marines could be wrong based on photos. Figure assembly consists of photos of the “Stick Here” variety and “copy the box art” painting directions. A small set of decals from Cartograf are provided and this time they include some specific markings for the guns. Six finishing options are offered: all appear to be for USMC units on Iwo Jima 1945, but three are identified as “US Army” which seems wrong. The choices are basically camouflaged or olive drab, with one weapon from the 3rd Artillery Battalion, 3rd Marine Division, coming with a pin-up and the name “GYRENE GAL”. Another OD weapon is named “MISS FORTUNE”. In summary, this compliments the first kit and now offers a choice for our “Leatherneck” friends.